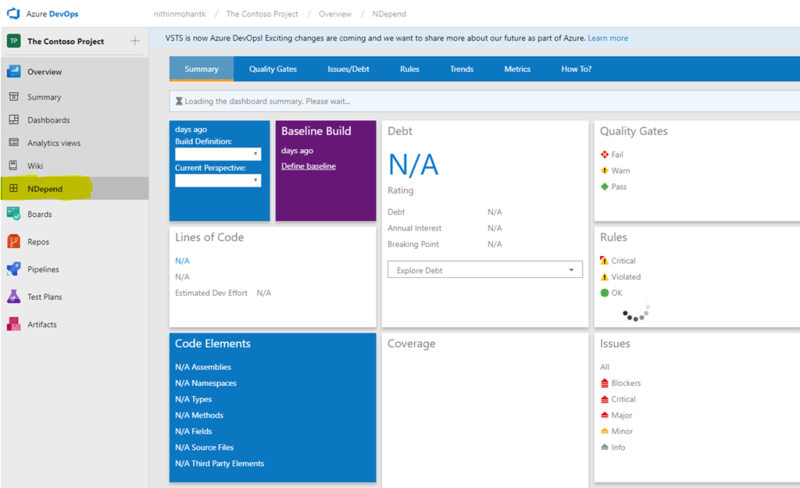 Azure Cosmos DB is a planet scale global document database which have been available for Azure Customers based on pay-as-you-go. Reserved Capacity is a new long term pre-paid billing commitment customers can get a discounted pricing. 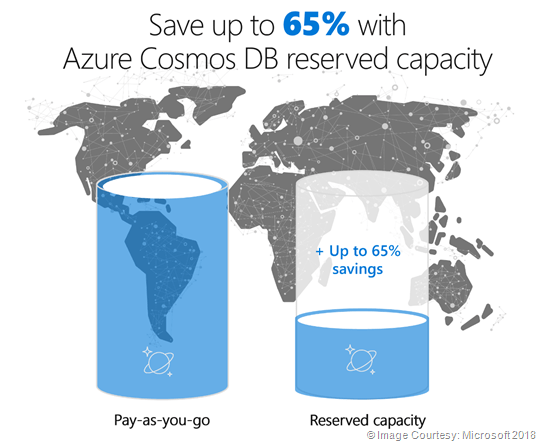 Azure Cosmos DB reserved capacity helps you save money by pre-paying for Azure Cosmos DB resources for a period of one year or three years. Reserve capacity allows you to get a optimum discount for the throughput(RUs) provisioned for Cosmos DB resources. For Ex: Databases and Containers (tables/collections/graphs). It can significantly reduce your Cosmos DB costs and it enables you to save up to 65 percent on regular prices with one-year or three-year upfront commitment. Reserved capacity provides a billing discount and does not affect the runtime state of your Cosmos DB resources. It is available to all supported APIs (including MongoDB, Cassandra, SQL, Gremlin and Azure Tables) and all regions worldwide. Scoped to a Single Subscription: that means a set of cosmos db account resources such as database or containers within the selected subscription. Shared/Scoped to an enrolment: Billing benefit can be shared across any subscription in the enterprise agreement or pay-as-you-go subscriptions. Who can opt-in for Reserved Capacity? This feature is currently only applicable for enrolment (Enterprise Agreement customers) or account (Pay-as-you-go customers). Users with MSDN Subscription benefits are not applicable for the Reserved Capacity benefits. 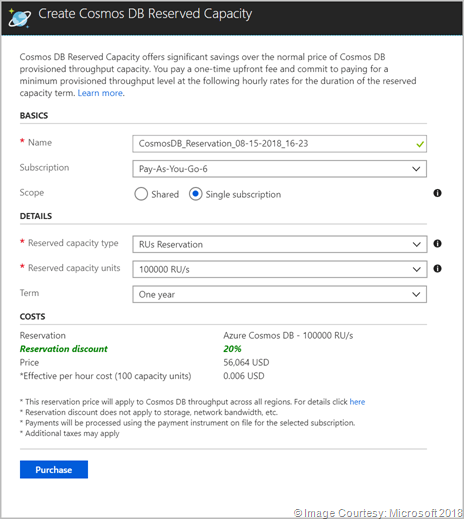 You can buy Azure Cosmos DB reserved capacity from the Azure portal. For more details review reserved capacity documentation. Recently while I was doing Performance Testing in one of the APIs interacting with Cosmos DB, I encountered a problem as Azure Cosmos DB API’s started returning Http Code 429. Http Status Code 429 indicates that too many request been received or request rate is very large. This error would happen when we have concurrent users trying to write or read from same cosmos db collection. Based on analysis it found out to be the Throttling happening from Azure Cosmos DB, as we make requests that may use more than provisioned Request Units(RU) per second. We were using default Cosmos DB configuration for a fixed collection of 1000 RU’s per second which is sufficient enough for a 500 reads and 100 writes for a 1 kb file. 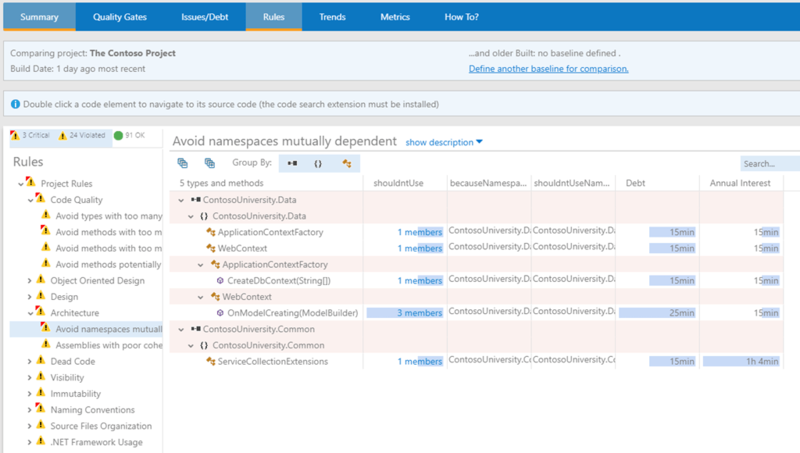 You can refer more about Request Units from Azure Docs. 1. Now first logical step we can do is to get rid off this error by increasing the Throughput for the collection. I am going to increase to 10000 RU/s maximum allocatable for a Storage Capacity: Fixed. This should ideally improve the Throughput for 250 or more virtual users hitting. Providing optimum values to the following Properties in RetryOption class to be passed as parameter to Connection Policy. During Ignite 2018, Microsoft has announced the availability of Maria DB support in Azure Database services. Today it has been opened for Public Preview for all Azure customers. 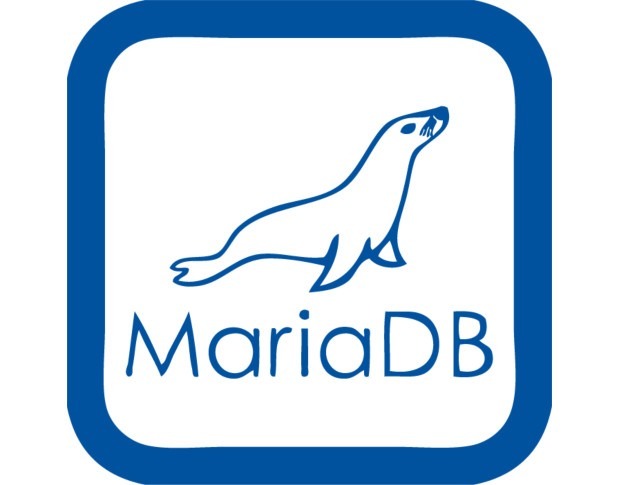 The Azure Database for MariaDB service is now available in preview. It offers an enterprise-ready, fully managed database service that based on the Community Edition of MariaDB. The service features open-source compatibility, built-in high availability, dynamic scaling, and flexible pricing. Customers can lift and shift to the cloud and use languages and frameworks of their choice, leveraging the power of MariaDB running on Azure. To learn more about the service, view the service page, pricing, and documentation. You can create a MariaDB server by using the Azure portal or Azure CLI. 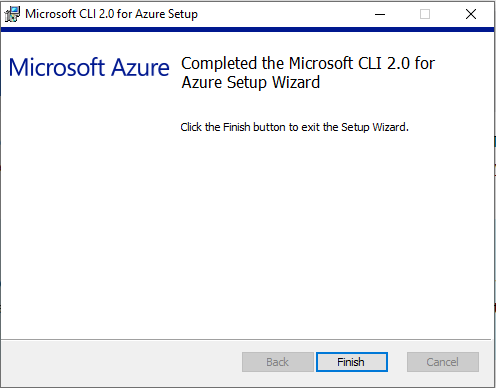 Purpose of this article is to help you with few steps of commands to provision a new Azure Cosmos DB database instance through Azure CLI or Azure Cloud Shell. 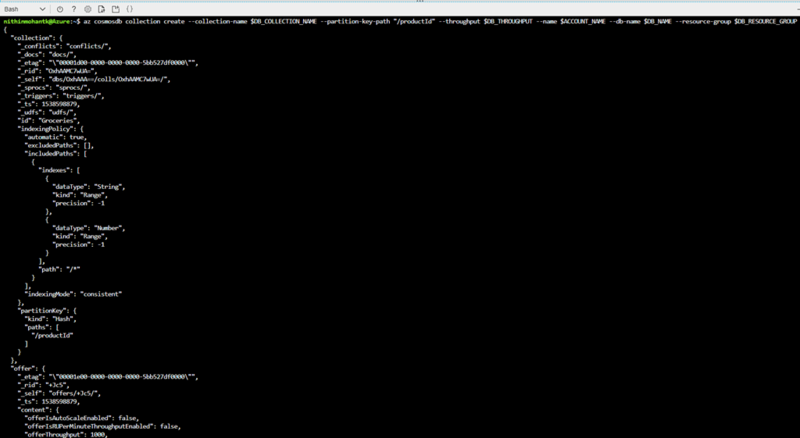 export DB_THROUGHPUT=1000  ## bare minimal for 500 read and 100 write configuration for a 1KB document. For the ease of this article I used Azure Cloud Shell, that you can launch from your azure portal by clicking on the Shell icon on the top portal menu. 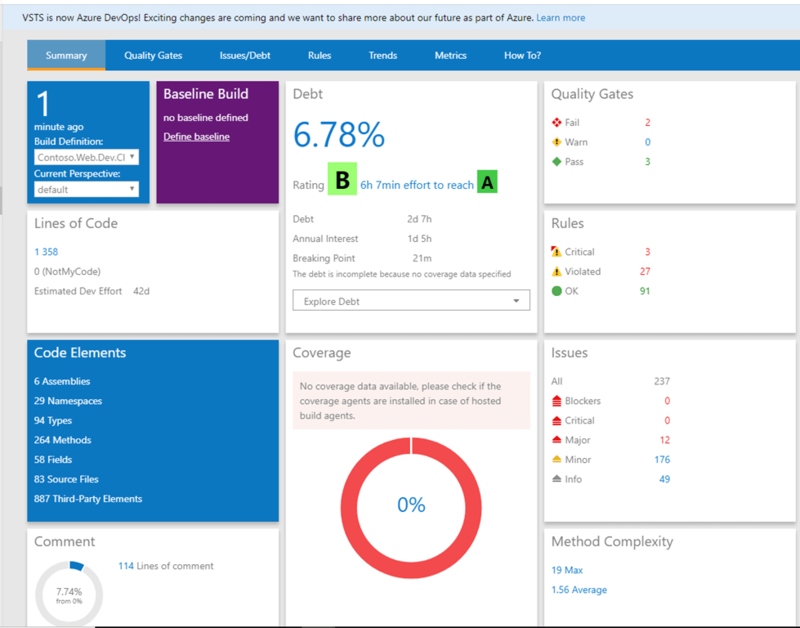 Now if you browse Azure Portal you can see resources created in “thingx-dev” resource group. Upon browsing with Data Explorer you can see the Groceries collection inside Products DB. 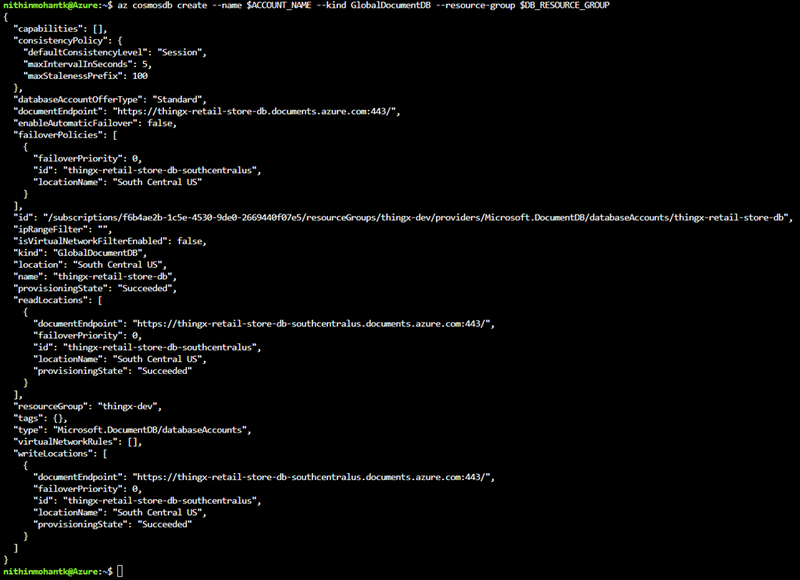 So that’s the few silly easy steps to create Cosmos DB database from Azure CLI or Azure Cloud Shell. Hope that makes it easy for you. 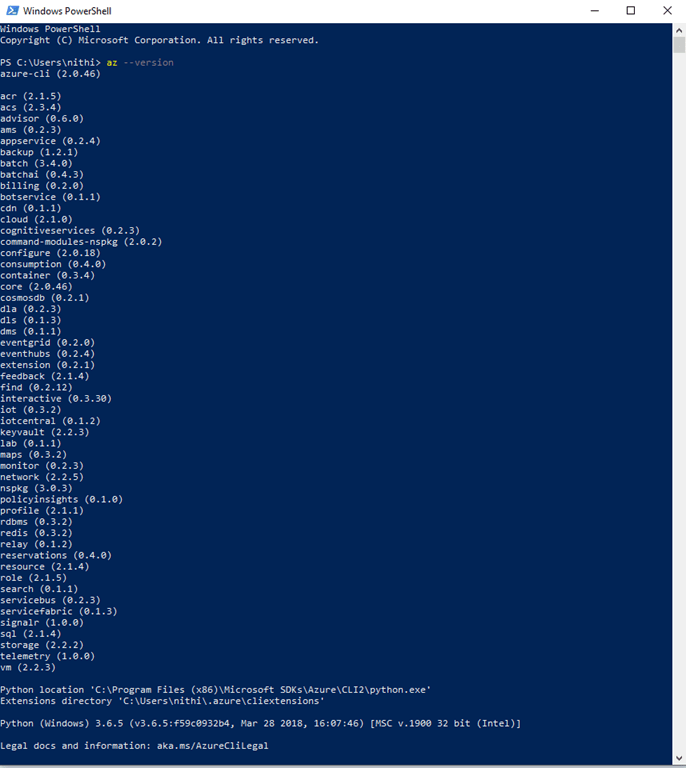 Older days we used to manage azure resources through AzureRM PowerShell modules . This was very much flexible for any Azure Administrator or Developers to run Automated Deployments to Azure Resource Manager resources. Azure CLI is the next improved version with simplified cmdlets to make life easier and it is cross-platform. Download Azure CLI designed for Linux/Windows/MacOS based on your OS. Install and follow the steps. 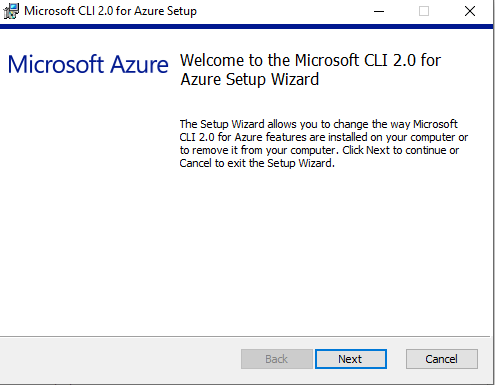 Running the Azure CLI from PowerShell has some advantages over running the Azure CLI from the Windows command prompt, provides additional tab completion features. Now let us try logging in to Azure using Azure CLI. There are various ways of logging in, for this article I would try simple web login using az login command. The Azure CLI will launch your default browser to open the Azure sign-in page. After a successful sign in, you’ll be connected to your Azure subscription. If it fails, follow the command-line instructions and enter an authorization code at https://aka.ms/devicelogin. az group create –name "thingx-dev" –location "southcentralus"
In my previous article I wrote an introductory about NDepend and how it will be useful for Agile Team to ensure code quality. In that article we found how we can use NDepend in a developer machine. 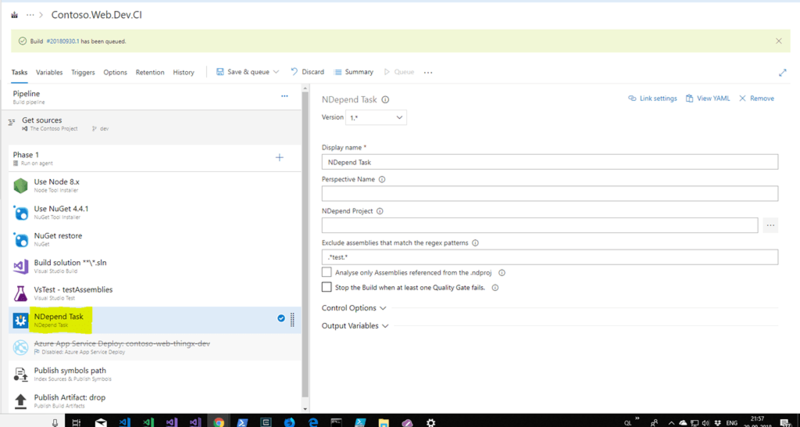 Now with this article we will familiarize ourselves in using NDepend in your build automation pipeline in your VSTS/Azure DevOps Build Agent. Manual Integration using NDepend Command Line Tool. 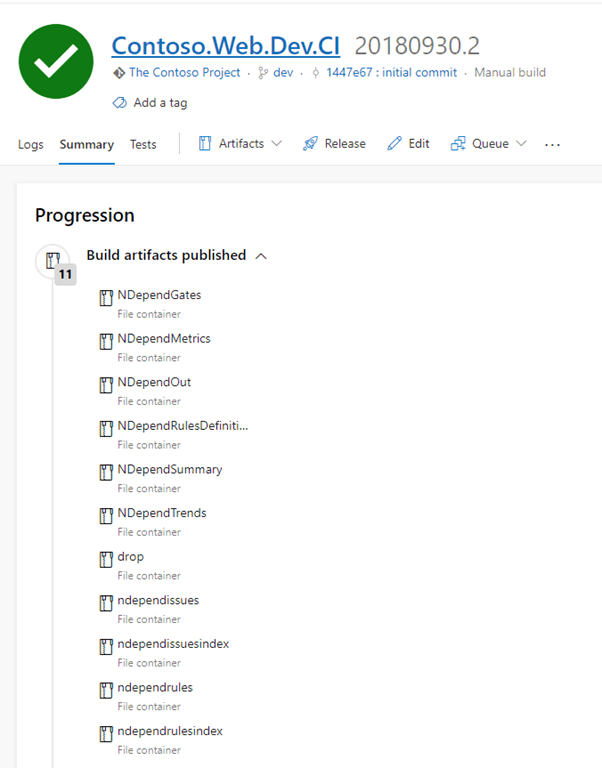 (This would provide you more control over licensing by setting up the license in your own OnPrem VSTS Build Agent. 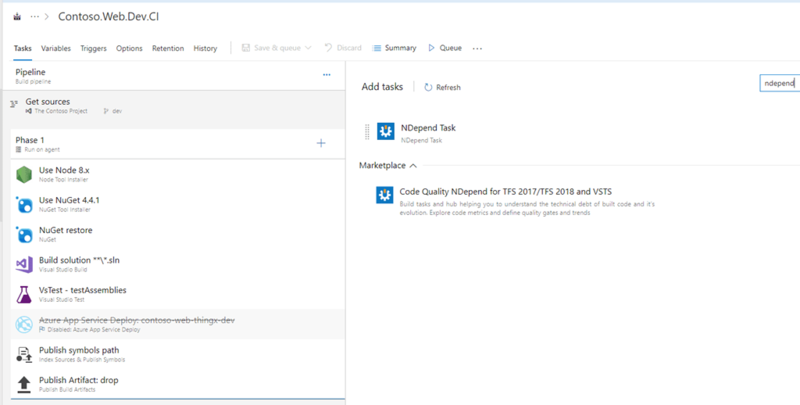 For the interest of this article I will cover the use of VSTS Package Extension and using NDepend Build Task in VSTS Build Pipeline. 2.) 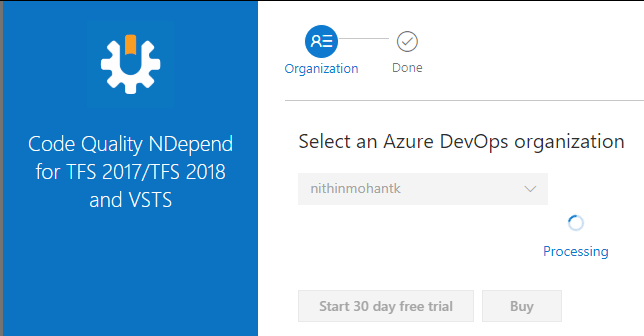 Click on Get to Install this extension in to your AzureDevOps account and follow the steps. For the demo purpose I am starting with 30 day free trial, otherwise you can go ahead and buy the full license. 3.) 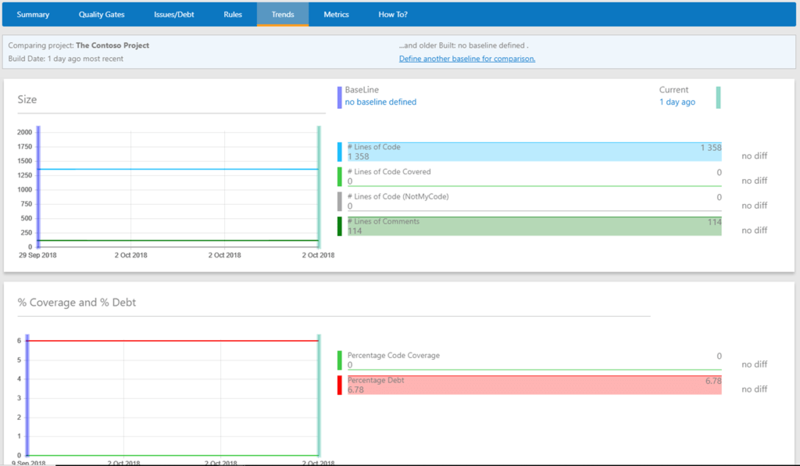 Now when you get back to Azure DevOps project, you can see the NDepend side menu enabled, this is where you would see the report summary of your project. You can choose to stop the build when at least one quality gate fails. You also need to specify the NDepend project file customized for your project, otherwise NDepend will use their default project file configuration. Having your own NDepend project file will provide you more control over the policies for the scan. Queue a new Build and wait for Build to complete. Now you can see the BuildArtifacts includes all NDepend report file. Now you go back to NDepend menu from Left side menu item in Summary Tab. This will provide you detailed view of Technical Debt in your project. In the next article I will cover the manual integration steps.